How to undo a two-colour skin tone? It was one of those weak moments that I threw caution to the winds. Carefree and worry free. A mistake. I did it without protection. Now, I am stuck with it. A) Go to a nudist beach and get an all-over tan? B) Cover up my lower arms ala bas-sekolah housewives with those Made-In-Taiwan hand’s socks and go to the beach to get a tan for my upper arms? D) Forever don’t wear short sleeves t-shirts? My days are numbered so not a good option. See the pic below? It is very, very obvious. Whee! I am going to Taiping tomorrow morning. My sons want to check out the skateboarding park there. I want to go to Kuala Sepetang (Port Weld) for mee banjir which I saw TV3 promoted few days ago. Plus, if the weather permits, we are going up to Maxwell Hill. 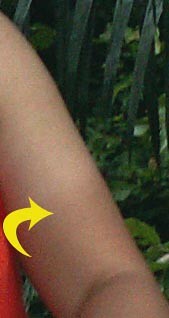 So meantime, please give me an idea how long our skin takes to change back to its original colour tone after a suntan? By LilianIn Humor19 Comments on How to undo a two-colour skin tone? Previous Previous post: The taming of the croc by the tigress! Next Next post: Traffic jam. Piang!!! emm….maybe u can try to use sunscreen on da tanned parts and then wear sleeveless shirts until da colour becomes even again? I don’t think that there is anyway for you to tan that part of your arm.. Unless you are using to use a tanning lotion.. Or fake tan. I saw one from Bananaboat. Lols. Still not as bad as my 2 toned face. i wore my sunglasses for too long, my nose got burnt, as well as the skin around the sunglasses. like a inverted panda! i think nevermind lah..! still look leng lui…and ppl won’t find it funny at all.. they just think that you very lucky.. went holiday somewhere exotic..!! Ely: Do you have a picture? Lilian: It won’t take very long if you either stay indoors or go under the sun constantly. Don’t worry about it. first soak the affected area with warm water. when skin become smooth and tender, use a piece of steel wool soaked in chrolox bleaching agent to vigarously scrub the affected area until the layer of tanned skin disappears. for faster effect, replace chrolox with sulphuric acid. go to “Edit”, then select “Undo”. Seriously, get a loofah & scrub off the dark skin cell. (with foam lar) It works. Go to a nudist beach and get an all-over tan? hahahaha..seriously if got one i dun mind..
for beach i prefer to wear those small speedos coz when u wear a shorts over u can’t see em. if you wear those long shorts, wahh banyak susah to cover lar..